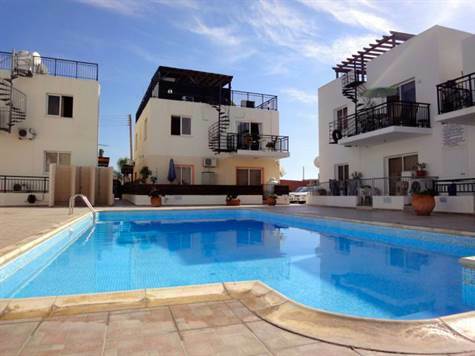 Cyprus Property Blog by Cleo : Kato Paphos Apartment for Sale - Just listed. Walk to the beach & harbor. Title Deeds. Kato Paphos, Paphos - This spacious two bedroom apartment is within easy walking distance to the beach and all the amenities of the popular resort of Kato Paphos. The picturesque harbour with it’s castle and wide variety of coffee bars, shops and tavernas is nearby, and there is a regular bus service to Paphos Town. The accommodation features a spacious living room with patio windows leading to a good size balcony overlooking the swimming pool terrace. The separate kitchen is well equipped with built-in oven, electric hob, extractor fan, fridge/freezer, microwave, dishwasher and washing machine. Another bonus is a useful full length cupboard, ideal for storing tall items such as ironing board, etc. Off the living area is a hallway leading to two double size bedrooms with fitted wardrobes, and a good size family bathroom with modern finishes. A spiral staircase on the balcony provides access to a large roof terrace with fitted pergola, barbecue, fridge, sink unit and a tile based shower. There is a large shed in one corner providing additional storage. The pool terrace has plenty of space for relaxing and sunbathing, and there are shower cubicles to the side. The property is being sold fully furnished and includes an allocated parking space. Due to it's great location, it is ideal as a holiday home/rental investment.